I will be failing in my humble life if I don’t start this message by thanking the Almighty God for preserving you up to this stage, you are a gem for our great nation Zambia. I was disturbed when I was briefed by my dear wife and other party members and people that came to visit me at the prison that you had fallen ill and admitted to the University Teaching Hospital and being treated by our own doctors there. What else can illustrate humility and patriotism than this in a country where those with access to state funds would have flown to foreign countries at a huge cost to the nation but you displayed true patriotism. I am however delighted once again to have been informed that you are recuperating and have since been discharged from the hospital and can only wish you quick permanent recovery. I would have loved to personally pay you a visit in hospital and pray with you but the circumstances which am found in really cannot avail me that chance. I am in circumstances that are difficult to explain but typically of what you and your colleagues of the time fought the colonial masters against. 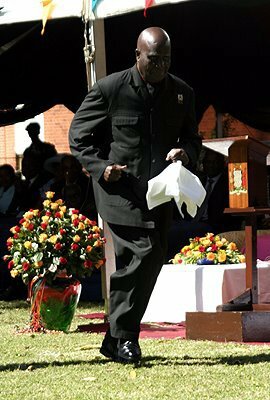 I am also alive to the fact that you have been to many jails prior to Zambia’s independence and also that even after you led the country with peace and stability for 27 years you also regrettably found yourself standing accused of almost the same charge that I together with my five colleagues face. To this effect, I will not get into any details to explain the inhumane conditions and other challenges associated with this type of life in this prison but I pray and continue to pray for your good health. May your continued demonstration of faith in our local hospitals inspire all of us to believe in our health institutions and medical personell and may it spur development to our hospitals. Get well soonest and long live our Independence Hero.